8000 Full View Aluminum Commercial Garage Door - The Wright Door Co.
DoorLink 8000 full view aluminum garage doors are a great looking option for businesses looking for a door that will improve the face and function of their structures. 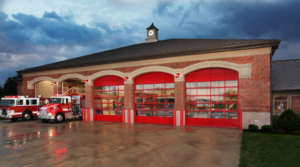 DoorLink garage doors are manufactured in the USA and are top of the line products. The 8000 Model doors have some features that make them stand out from the other choices. They are thick, durable, and made with the highest quality aluminum. 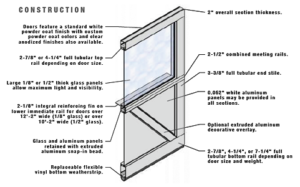 There are a variety of choices for windows, panels, glazing, and even insulation. Please see manufacturer info below for more technical specifications. 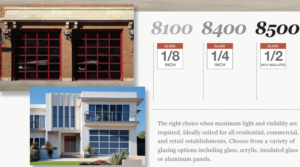 The 8000 aluminum full view garage doors are 2″ thick. Constructed with extruded aluminum rails and stiles assembled with 5/16″ threaded rods and nuts. Glazing is sealed on all four sides and retained on all four sides with extruded aluminum snap-in beads. Options for various panel sizes. Hinges and brackets are made from galvanized steel. Rollers have (10) 1/4″ steel ball bearings in case hardened races. Springs are oil tempered helical wound stress relieved torsion springs. Springs are mounted on a cross header shaft supported by bearing brackets. Springs are calculated for 10,000 door cycles. Springs that are calculated for 25K, 50K, or 100K cycles are optional in place of the 10K. Cables are galvanized aircraft quality with a minimum 7 to 1 safety factor.